Named after the Hindi word for purple, Jamini is an Indian-inspired lifestyle brand based in Paris's bustling 10th arrondissement. 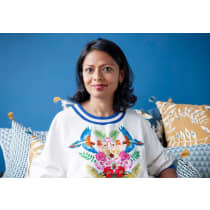 Through the boutique's varied range of handmade textiles, owner Usha hopes that she can offer customers a window into the rich culture and creativity that India has to offer. "We take our inspiration from the region of Assam, which is rich in natural resources such as tea, wood, and coal. It also has a thriving textile industry, and has pioneered many distinctive weaving techniques."